The Audubon 16 inch clear hanging or pole mount baffle provides protection for your feeder or house. This baffle comes with an easy to install adapter to allow for it to hang or pole mount. The Audubon Torpedo Baffle installs easily onto poles using the adjusted coupler included. Durable steel construction and coating will provide years of protection from squirrels. 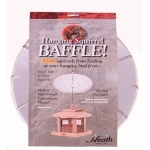 This Squirrel Baffle by Heath protects hanging bird feeders. It is designed to tip with the slightest touch. This post-mount Squirrel Baffle by Heath features a flange mounting style. It fits .5-inch to 1.25-inch poles, and it mounts with three set screws. The Squirrel Baffle fits on any pole 0.625 to 1.25 inches in diameter. This feeder prevents squirrels and other critters from climbing your bird poles without having to purchase additional squirrel-proof feeders. The wrap-around design of this Squirrel Baffle allows you to attach this add - on without disassembling your bird feeder and bird pole. 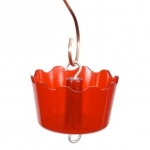 Perfect for protecting hummingbird and oriole bird feeders from ants! Use with any feeder where ants or crawling insects are a problem. Polycarbonate plastic with metal hooks.